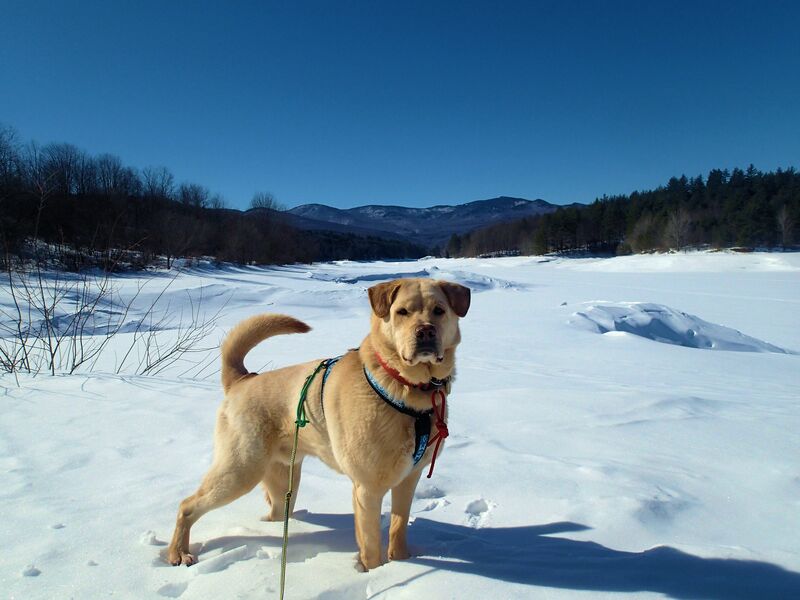 “May the sun shine warm upon your face” | Vermont Paddle Pups! As the Irish Blessing indicates, we all love the feel of the warm sun on our faces…our days of sun have begun to appear with greater frequency, and we’ve even had some warmth! Maybe we’ll have a super warm and sunny St. Patrick’s day hike! 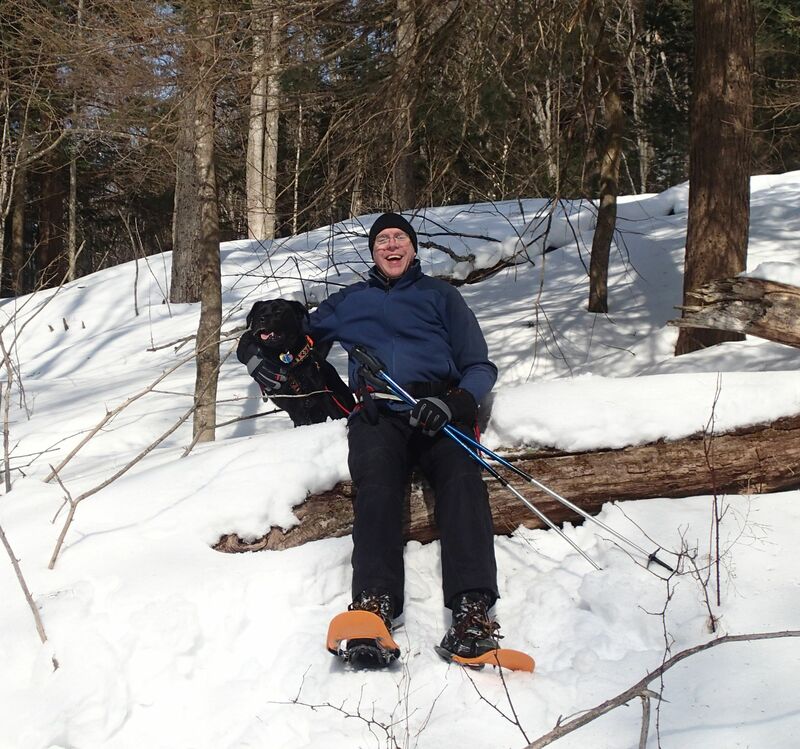 We started off the month of March with a 3-day trip to Rangeley Maine. Thankfully, the temperatures ranged from 2 below to 25 above…quite an improvement over last winter. Here is a short video journal of that trip…. Back home, we continue to feel that cold, and very windy can be nice…if there is a shining sun. 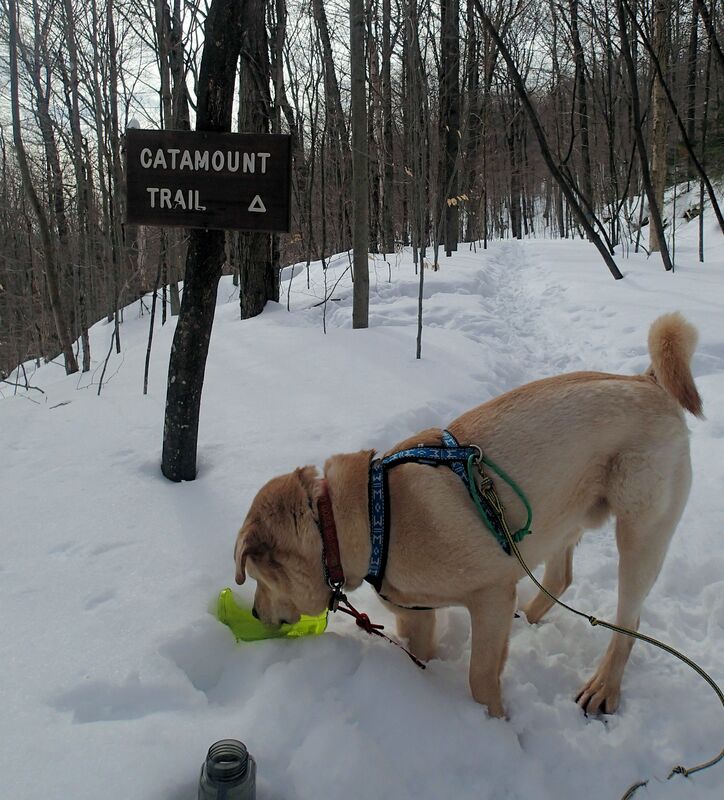 On such days, we visit one of our favorite paddling locations, and do an data collection hike, for our Poo Crew duties, at our local trail network. At Waterbury Reservoir….beautiful, and cold. 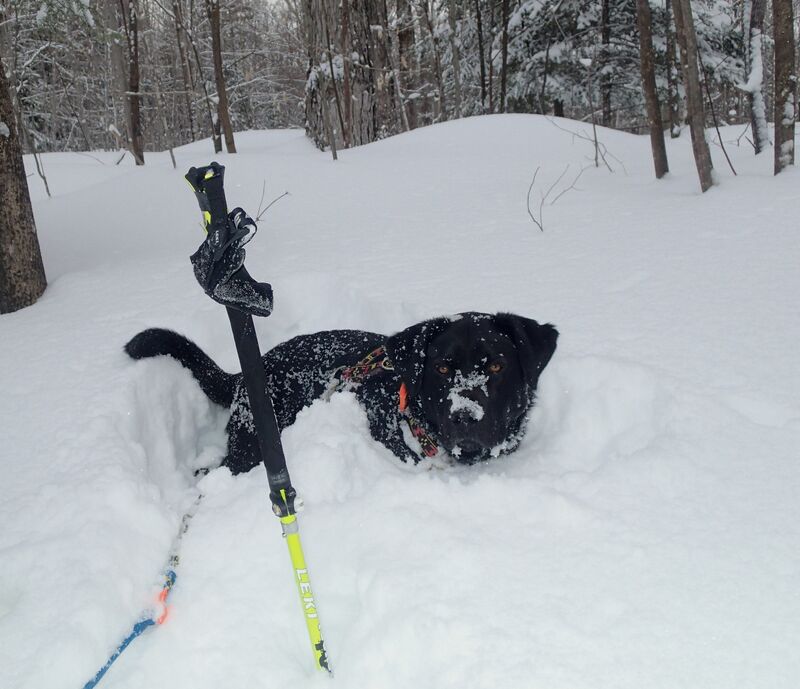 Unfortunately, lots of dog hikers did not follow LNT principles on the trails! Edgar will definitely miss the snow when it is gone! But the snow will be here for a while…still 3 feet or more in Kirchner Woods! 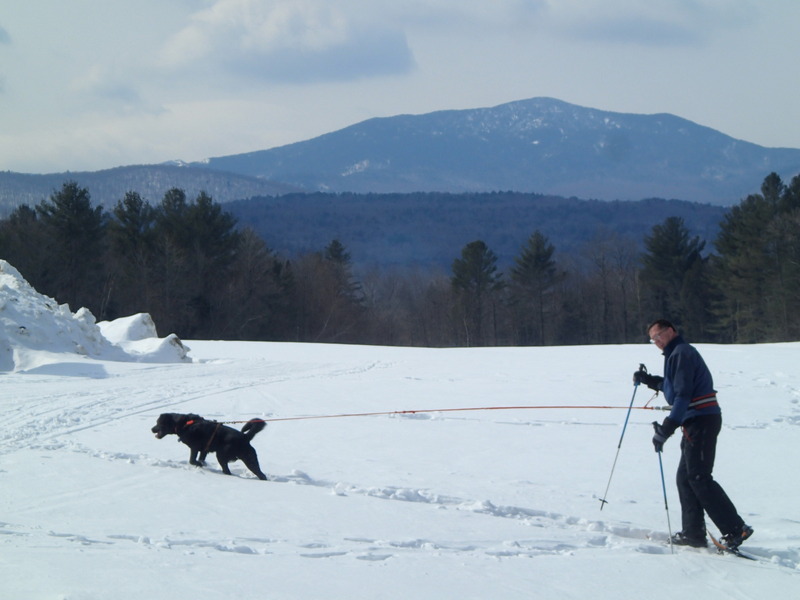 As the temperatures rise, the plentiful snow cover begins to soften, and we check out a few potential skijor locations….We head to Cricket Hill Trails, a local network of trails open for XC skiing and snowshoeing. Hurrah, dogs must be on a leash here! ( But of course, the only other dog we see is free range….) 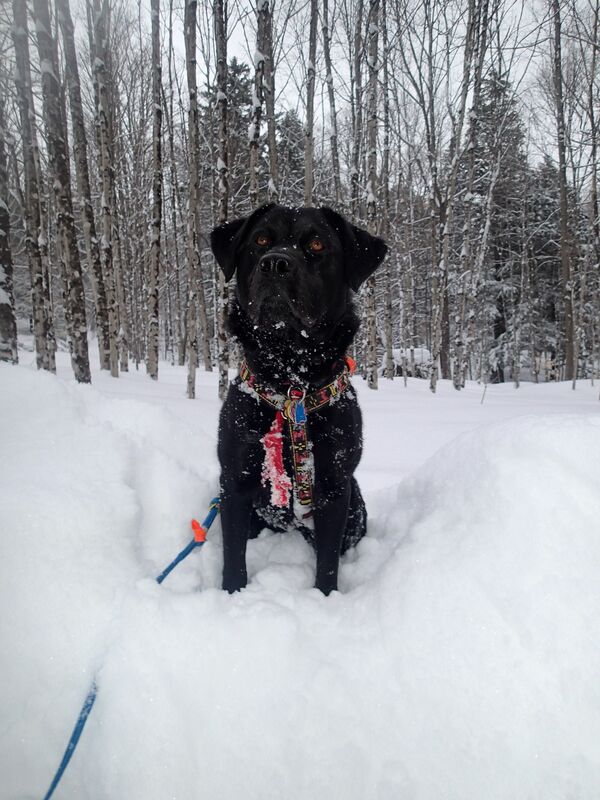 The snow is fine, but the trails are hilly and wooded, so we opt to use our Tubbs. Great views on the upper field…. We finally get out to the NEK trails we had tried to visit earlier in the year, but never did, due to sub-zero temperatures. 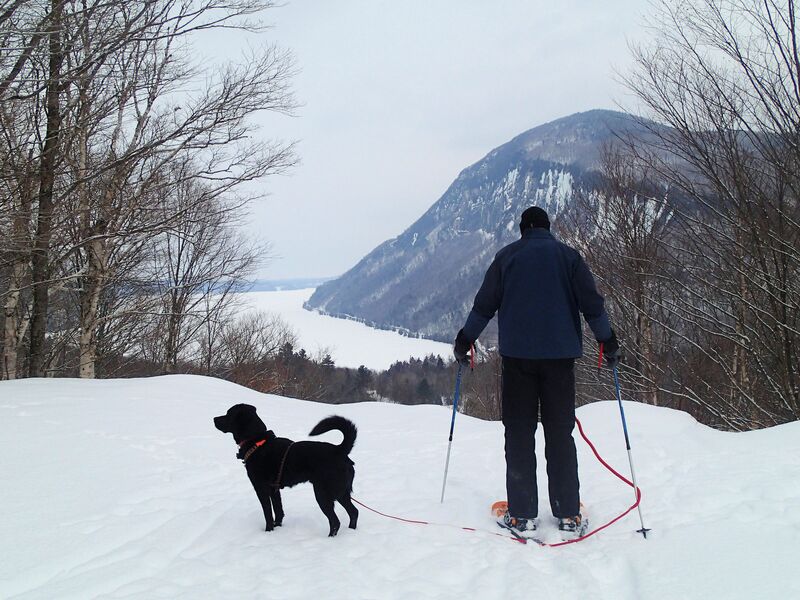 We knew there were suitable XC trails for skijoring, but since we had never been there before, and since there is a 1/2 mile climb up to the trails, we decided snowshoeing was the better option. We had a great climb up to the summit loop, with some trail breaking…mild temperatures, and though the sun was not shining, it was a very nice workout. 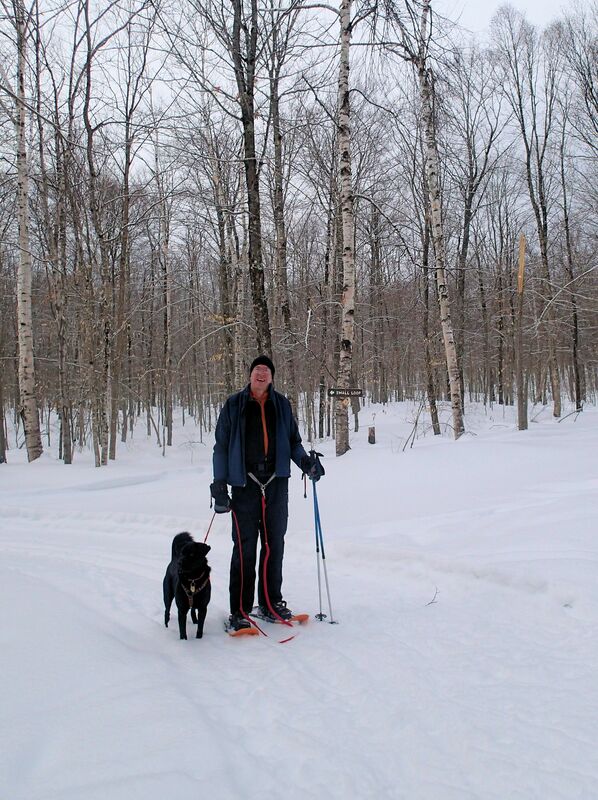 We will certainly return, and attempt some skijoring on the various loops. This week, the thermometer actually climbed above 40(f) for the first time in over 3 months….it felt delightful and encouraged us to get out and play, soaking in the first real sensations of spring…. Griff and I climbed up Elmore Mt, which we climb often in the summer ( always at sunrise, to avoid the crowds!) Microspike clumping was noted, as the temperature was in that narrow range that results in very sticky, glue-like snow…on the return down, the snow had softened up, and I was able to continue to use the spikes for the descent. 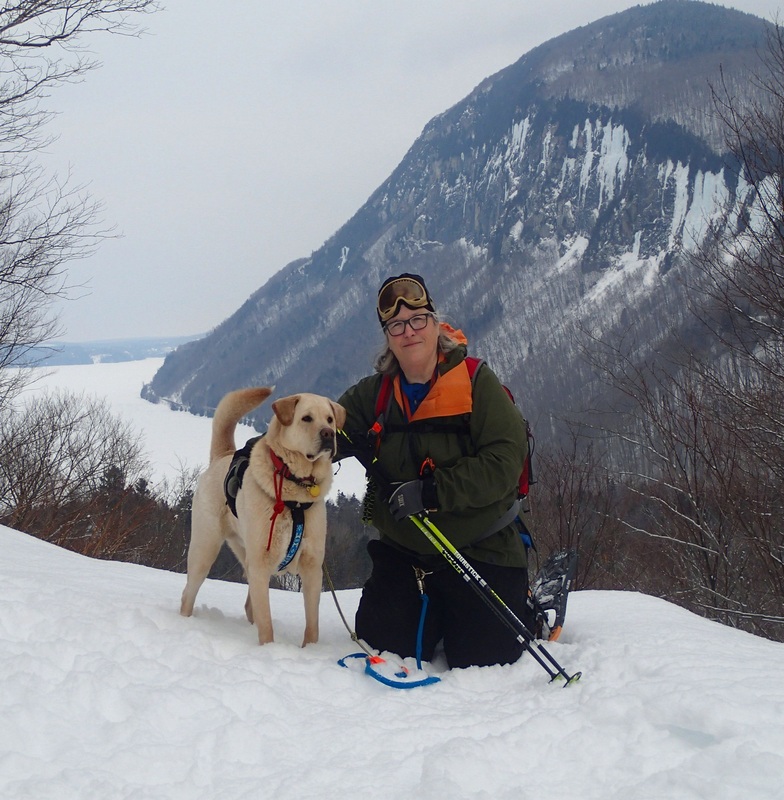 Though I carried my trusty snowshoes on my pack, I never had to rely on them. Of course, I never noticed the smudge on the camera lens…it was not bluebird skies, but the sun was shining bright, so it was a great hike! It was warm, so frequent water breaks were essential. Griff tried out his new OllyBottle for the first time ( so far so good! )…we’ll be reviewing it after we use it a bit more…. And our news of the week…Edgar won the dog paddling photo contest! Thank you so much, https://www.facebook.com/GETOUTDOORSNC. The judges obviously saw the spontaneous joy and humor in his photo…he is not great at posing for photos, but sometimes we get lucky, and catch his goofy personality! He will no longer have to use a hand – me – down doggy PFD, but will have his own sparklin’ new Astral jacket! We have also just received our first batch of dog gear to use ( Thank you Backcountry K-9 ! ), and review. It will be fun to try new gear with Griff, and Edgar may also get to share as well. First reviews will be forthcoming in next blog post. And now we look forward to colder temperatures, and more snow over the weekend…our deck is clear for the first time in months, but we still have a ton of snow in the woods…lots of time for more snowy adventures! 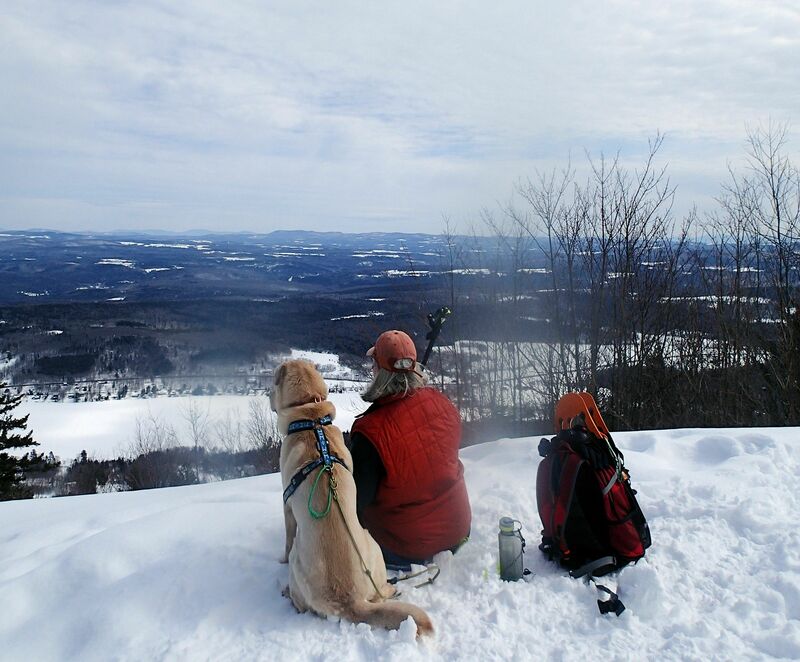 ← Farewell Frigid February Frolics…..
What beautiful photos! I think we’re all saying goodbye to February and the cold, even though the furkids didn’t mind it at times! I can’t wait for all that snow to melt and go away, the cold temps too! Yes! Today’s hike was below zero windchill (f)…I am ready for canoeing season! Oh my gosh! Your pictures and your pups look incredible. It was great visiting your site today for the first time. Thanks, glad you enjoyed your visit!